Happy Friday! I've got some fun and exciting news! 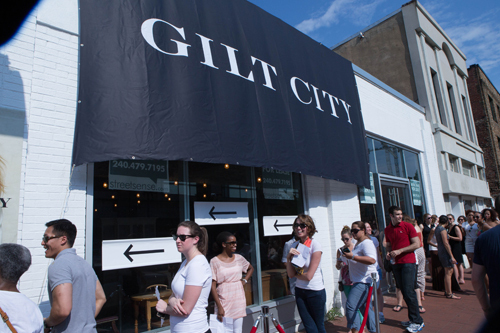 Next Friday night, Gilt is hosting their legendary 2-Day Warehouse Sale Event in Washington, DC and they've invited me to their VIP night! I know, me VIP? Crazy, but I am so excited to peruse the endless racks of goodies they'll have. Okay, excited doesn't even begin to cover it. If you don't know what Gilt is, then please let me tell you! It's a members-only (membership is free) shopping sale where top designer labels sell they're goods at 60% off retail. We're talking about clothes, shoes, jewelry, home accessories, food, & drink. Lots of goods. It's first come first serve so you have to act fast and snap things up when their sales go live everyday. The other times have a wait list (you can get added to the waitlist) - you can access them here. And I'll be Instagram'ing while I'm there so follow me to see what goodies are in stock! Any other DC bloggers going?? I'll be headed to Atlanta this weekend for a much needed girls trip. I'll be hitting up some great shops, including Pieces (so excited! ), so come back next week to hear more about my shopping expeditions with the girls! Have a great weekend! **Don't forget to enter the Curtainworks Giveaway! Ends tonight at midnight!